This time last year, Major League Baseball, like that lady with no nose on The Knick, was in danger of losing its face. Derek Jeter, the fist-pumping, jump-throwing, grounder-up-the-middle-missing icon who’d been baseball’s most recognizable star for close to two decades, was retiring, leaving the league with a void that countless doomsaying columnists fretted it wouldn’t be able to fill. It’s not the most photogenic face: To be honest, it kind of looks like Lance Berkman. 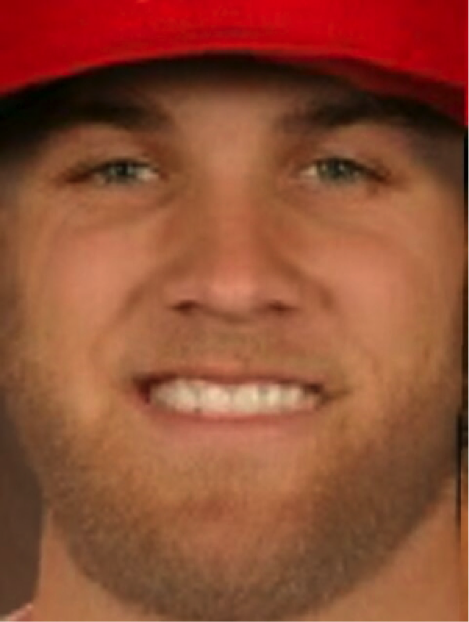 Fortunately, it’s not one face, but two, a slightly disturbing hybrid that stared at me from my smartphone screen when I used an app to blend the two best players in baseball. Meet Mike Harper, a.k.a. Bryce Trout. Four years ago, Bryce Harper and Mike Trout were the top two names on the preseason prospect lists at Baseball America and Baseball Prospectus. Now, Harper and Trout are the top two names on the 2015 WAR leaderboard, as well as the FanGraphs leaderboard for projected rest-of-season WAR. Their transitions from best prospects to best players — a rare feat for even the most “can’t-miss” minor leaguers — have brought a few hiccups: Trout hit a now almost inconceivable .220/.281/.390 in his 2011 cup of coffee, and Harper, who debuted the following year, suffered a series of injuries during his first few seasons that held him back from blossoming the way Trout did in 2012. But with both players leading their leagues in home runs and Harper recording MLB’s highest walk rate (18.0 percent) and best slash line (.330/.455/.664), there’s no disputing that both players have fulfilled their prodigious potential, treating us to a possibly unprecedented overlap of league leaders with unmatched present performances and equally impressive long-term outlooks. It’s not just that Trout and Harper have been the best players in baseball to date, or that they’re also projected to be the best between now and October; it’s how long their mutual reign might reasonably be expected to last. Given their ages, their excellence, and the trajectories of the most comparable players of the past, Baseball Prospectus projects each of them to be worth at least seven Wins Above Replacement Player in every season between 2016 and 2023. At no point in that eight-season span, which would take both players into their early thirties, is another player projected to finish a season first or second in WARP. That doesn’t mean Harper and Trout will have an uninterrupted run as league leaders: Injuries, bad bounces, or Carlos Correa could easily end the streak. It’s just that there’s little reason to bet on any other player to be the best in baseball for the foreseeable future. And that’s unusual, given that it usually takes enough time for players to reach the top of their profession that once they do, age-induced decline is right around the corner. The stats say that’s not wishful thinking. Cesar Cedeno notwithstanding, players who arrive and excel early are better bets to age gracefully than the typical player, so the precociousness of Harper and Trout doesn’t indicate that their decline timeline will be as accelerated as their stardom. Both players have displayed adaptability as well as raw physical skill — Trout by turning his only apparent weakness into a strength, and Harper by becoming more patient, less pull-prone, and less vulnerable to outside pitches, avoiding the “disappointing player” label that he seemed close to acquiring. The dominance of Harper, who won’t turn 23 until October, and Trout, who turns 24 on Friday, comes amid, and has helped to propel, a return to normalcy in MLB’s aging pattern. In 1998 — symbolically, at least, the height of the PED era, highlighted by the McGwire-Sosa home run race and Brian McNamee’s meet-cute with Roger Clemens — players 30 and older produced more than half of leaguewide WAR for the first time since 1945, when many young players were still in military service. Aided, perhaps, by stricter PED testing, which has coincided with (if not necessarily caused) a decrease in the historically anomalous aging curves that marked the so-called steroid era, the over-30 crowd’s share of total WAR sank below 30 percent from 2011 to 2012, reaching its lowest point since the 1970s. Although baseball’s graybeards have bounced back a bit in the last few years, the ultrayoung have made even greater gains. 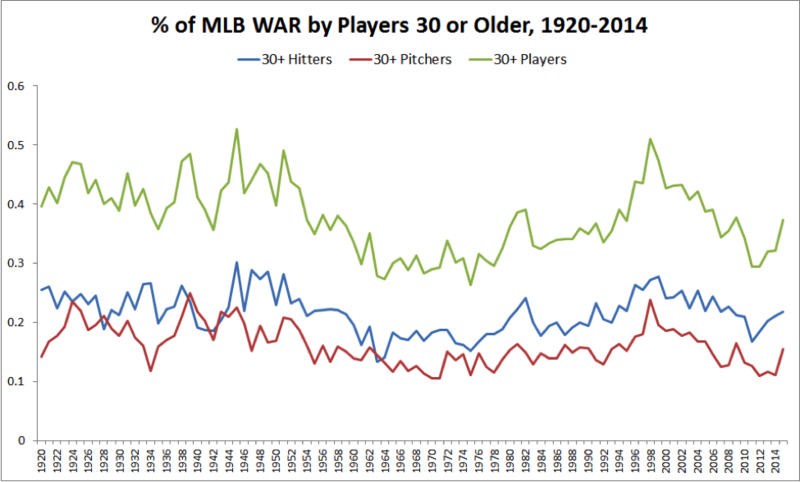 As FiveThirtyEight’s Rob Arthur showed last month, MLB’s average age, weighted by WAR,1 has continued to decline, dragged down by an unusually strong offensive performance by players in their early twenties. “I just think it’s a generational shift, and we’re really fortunate that the group that’s coming along is diverse, extraordinarily talented, and really appealing from a personality perspective,” Manfred says. Much of the young-player performance has been driven by rookies like Joc Pederson, Correa, and Kris Bryant, the latter two of whom have been big parts of a banner year for top-prospect debuts. But no two players are more responsible than Harper and Trout, whose experience would probably make them seem older than they are if we didn’t marvel at their ages so often. Barring injury, Trout and Harper, who are starring for teams that are likely to qualify for the playoffs, are strong favorites to win 2015 MVP awards in their respective leagues. In the 93-season history of baseball’s MVP award — which goes back to 1911, under various names and with multiple interruptions — the winners have had a combined age under 50 only seven times, including 2014, when Trout teamed up with 26-year-old Clayton Kershaw for a combined age of 48. This year, Trout and Harper have a combined seasonal age of 45, which would be by far the lowest figure for any MVP duo. Of course, MVP award winners aren’t always the most valuable players, as Trout discovered in 2012 and 2013, when he finished second behind Miguel Cabrera despite beating Cabrera’s value statistics by a significant margin over that two-season span. In some cases, it takes time for a player’s reputation (and, by extension, his ranking on BBWAA ballots) to catch up to his stats. But what if we, unlike those voters, use WAR, which doesn’t discriminate based on experience? The table below lists the youngest combinations since 1901 of AL/NL position players who led their leagues in WAR (excluding pitchers, whose hazardous jobs make them less likely to stay intact long-term). For reference, the average age of a league WAR leader is 28.0. A 20-year-old Trout makes the list, along with Buster Posey, but Posey, a catcher, was 25 in 2012, almost an old man relative to Harper. The only previous year in which both leagues’ WAR leaders had seasonal ages below 24 was 1941, when Pete Reiser and Ted Williams — one a center fielder, one a corner outfielder, like Trout and Harper — paced their circuits as 22-year-olds. It’s an apt comparison, not only because of the players’ positions and ages but because the hyperaggressive and injury-prone Reiser was often invoked as a worst-case comp for Harper when it looked like outfield fences might be the biggest threat to the Nationals star. Reiser wasn’t a Sports Illustrated cover model as a 16-year-old, mostly because there was no such thing as Sports Illustrated at the time, but a contemporary observer might have had the same hopes for him that we have for Harper, and Williams was as good as his early success suggested. If there were any doubts that Reiser’s and Williams’s ’41 seasons were the start of something great, they stemmed from the looming threat of a global conflict, which ultimately cost both Reiser and Williams their age 24–26 seasons. Happily, Harper and Trout aren’t on the verge of enlistment, although Trout already has the haircut and, given his fascination with weather, might make the world’s greatest Grey Beret. According to the Q Scores Company, Trout and Harper entered this season with 74 percent and 73 percent familiarity ratings, respectively, among baseball fans surveyed, behind 20 other active MLB players. Among the 74 percent of fans who had heard of Trout, 22 percent listed him as one of their favorite players, while only 8 percent said the same about Harper, probably because they were jealous of his gel. The company is currently refreshing those results, and one would imagine that the new numbers, which should be out by the end of the month, will show that Trout and Harper have made some strides. For now, they’ll still fall short of Jeter, whose familiarity level among MLB fans stood at 90 percent in April (with a 43 percent “favorite” rate).2 Among the general public, the awareness gap is far greater: In January, 61 percent of all people surveyed had heard of Jeter, while only 21 percent had heard of Trout and 15 percent had heard of Harper. But the age and experience gap is considerable, too, and the younger players have plenty of time to pull even, making up ground with every insane Harper hot streak and every day Jeter spends in retirement, poring over raw copy for The Players’ Tribune. Regardless of how many other young sluggers stand out in October, Harper and Trout would almost suffice, since they run the superstar spectrum. Not only do they showcase every skill great players possess, but they’re off-the-field opposites, aside from their shared drive to be the best at baseball. Harper is excitable and quotable, either arrogant or confident, depending on your proclivities when it comes to judging famous strangers from afar. Trout’s pieces of flair all come from his play as opposed to his pomade: He has yet to utter an interesting sentence with a reporter around, but he delivers the powerful lunch-pail appeal of a good-natured guy who “goes about his business” and happens to be better at that business than anyone else. Like Jeter, he’s never been ejected from a game. Harper is ejected more than Matt Williams would like. It’s Vegas versus Millville. If you like lightning rods, you have Harper. And if you like lightning, you have Trout, who probably also likes lightning and would love to discuss when the forecast says you might see some. This is a year about which future Ken Burns/Roger Kahn equivalents will make mawkish documentaries or write cloying books. And we won’t be able to blame them, because the seasons Trout and Harper are having are every bit as impressive as the best from the black-and-white era. We’re past the point of dreaming that Trout and Harper might play like Mantle, Mays, or Aaron. They already are. The only source of suspense is whether they’ll have the same staying power. Three months ago, the possibility that Harper would match or surpass Trout in WAR for even a single season still seemed remote. If the season ended today, though, Harper would win the head-to-head WAR-off, if only on the right side of the decimal point. While Harper’s emergence makes “Trout or Harper?” a great “Who Ya Got?” (I’ll still take Trout), it almost doesn’t matter who is, or will be, better. The best part about them is that baseball gets both. “Frankly, I don’t want to have one face of the game,” Manfred says. 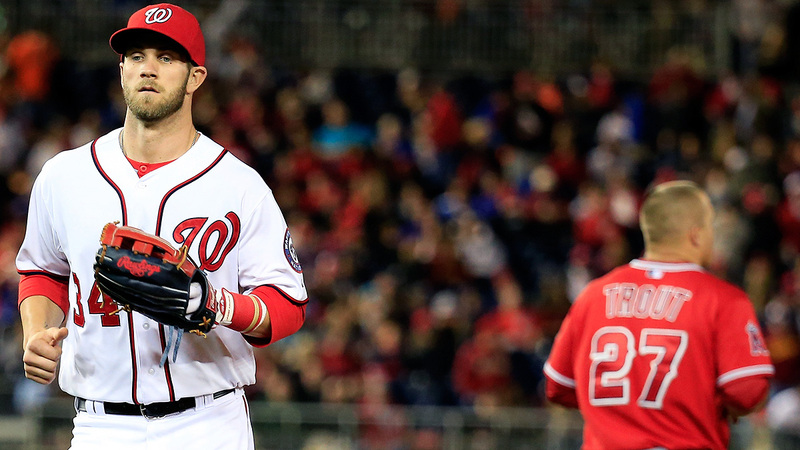 “I want to have 10 faces of the game.” With Harper and Trout, he’s one-fifth of the way. Whether charismatic superstars can create new fans, whether nationally known stars are integral to MLB’s long-term health, and whether an orchestrated marketing campaign composed of hashtags and Vines can deepen a bond as sentiment-based as fan-player allegiance are all unknowns that seem more like matters of faith than questions with concrete answers. But for those who already count themselves among the converted, Harper and Trout are making it more likely that Showalter is right. Thanks to Sean Forman and Hans Van Slooten of Baseball Reference, Rob McQuown of Baseball Prospectus, and Henry Schafer of the Q Scores Company for research assistance. A method of calculating average age in which a player’s influence over the average is proportional to his production. The 10 percent of self-described MLB fans who haven’t heard of Jeter might want to consider reclassifying themselves, although I’d love to hear who and what they have heard of. Which probably means we can count on more of everyone’s favorite: midgame, in-dugout interviews!